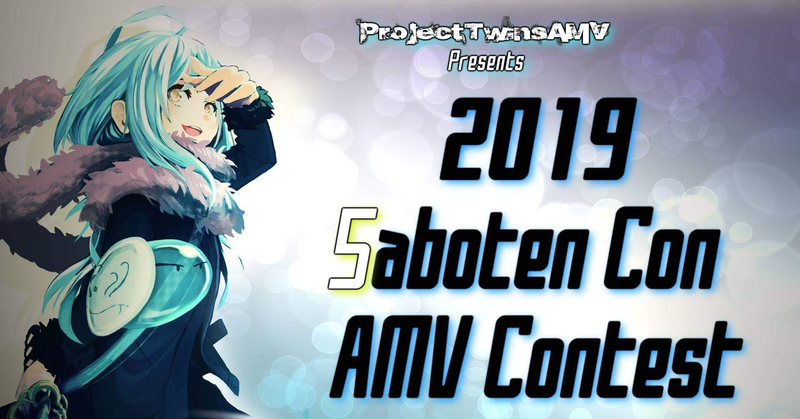 Saboten Con - AMV Contest is now open! Mar 25th 2019 08:45 PM|AMV Contest is now open! 1. Will not accept any physical media you submit to us unless otherwise you need to, please contact us. 2. You grant us unconditional, irrevocable, and eternal permission to use your submission(s) in any way, which includes (but is not limited to) copying, sharing, and exhibiting, as well as any purposes and usages that may be unrelated to this event. 3. The coordinators and judges may, at their discretion, re-categorize any entry they deem unsuited for the category specified by the entrant. 4. The coordinators and judges have the right to disqualify any submission for any fair and justifiable reason not foreseen in these rules. 5. All judgments and decisions are final and will post up the finalist in each category. 6. Do not submit someone else’s AMV as if it were your own. Do not submit an “improved” version of someone else’s AMV unless you have the original creator’s explicit permission to do so. You may submit a maximum of two AMVs per person. No two AMVs may be for the same category. 2. Intros, closings, and identifiers. Entries may not use studio trademarks (e.g. Paramount, DreamWorks, WB logos, Funimation, etc.) unless it is intentional, it will be negotiated with before the entry is put in the contest. For those with this concern, it is recommended to look over your submission or to not add that content at all. This included language in the audio/ music. Your entry must be fresh prior from November 1st, 2018 to present. • Please add 5 seconds of black screening to the start and end of each entry. • Files much be MP4, AVI, WMV (MP4 is highly suggested). • Files averaging ~30MB per minute (75MB minimum, 300MB maximum). • No video quality defects such as blurring, interlacing, macro-block. • Audio must at lease 128 Kbps or higher, since will have better equipment this year. Please check audio before sending, had some videos last year with low audio. • Any language use, and inappropriate content. • Poor video quality and sound, again please check over your videos. We are only allowing electronic entries (via-email), no physical entries allowed. - Entries being submitted online (via e-mail with the video links; Sendspace, Mediafire, google drive etc.) must be fully uploaded by the DEADLINE ON JULY 27TH 11:59PM ARIZONA TIME. Send all info to projecttwinsamv@outlook.com . - Once your AMV has been submitted to us, we will send an e-mail confirming (If I can reply in time) that we have received the entry. also be posted on the this forum. o (If there is NO time before the deadline or NO changes can be made based on the rules above) It will be disqualified. Remember, THE DEADLINE IS July 27TH 11:59PM ARIZONA TIME. We will post the finalist a few days before the convention weekend. Please put AMV submission as the subject line for your entry.